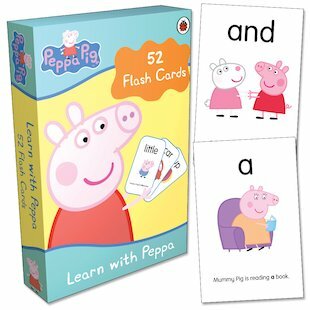 With an oink, a grunt and a squeak, Peppa introduces simple words and concepts on these colourful cards. Perfect for sharing with parents, the double-sided cards contain 102 different words to read, recognise and learn. Each side includes a word, a simple example of its use, and a colourful picture featuring Peppa and her friends. Sample sentences let children see how words are used in everyday language, while the pictures encourage them to name objects and grasp first concepts such as “little” and “large”. Ideal for shared games and reading practice, these are a great way to build skills at home with the lovable Peppa Pig!